Seriously Mr Bunny, you visit us way too early. What's up with that? We heard Noah, Oscar, Mietta and Zali whispering and cheering as they searched for their Easter Bunny treats at 6am this morning. Check it out on Snapchat. 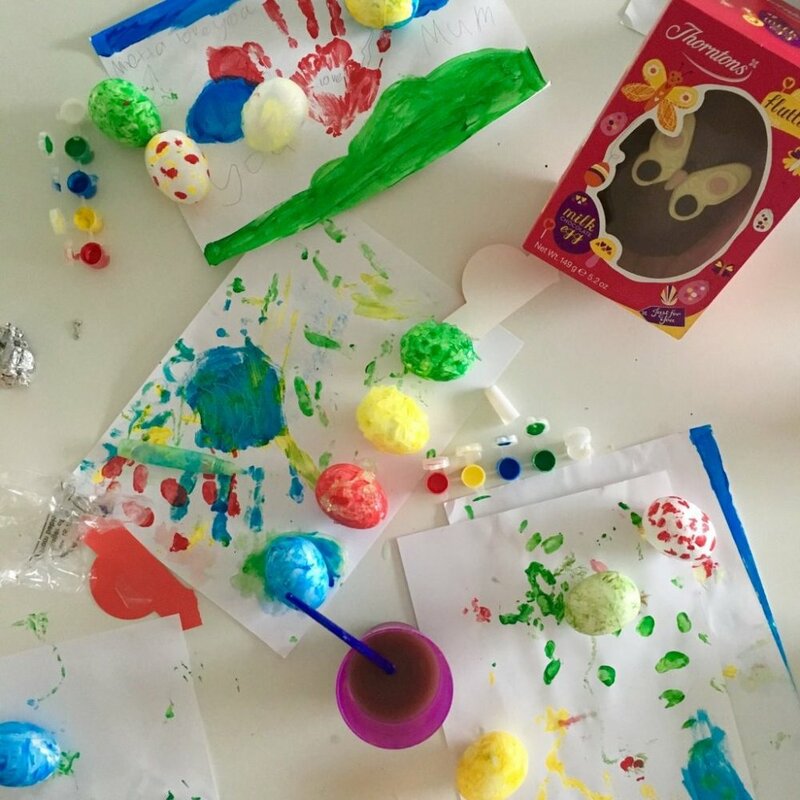 Of course where there is chocolate, there is crafts to continue our Sunday sleep in. I know. I am a thinker! Easter is about new life. Keep it green and don't forget our 30 push ups per day! Our #pushupsandgreen challenge has been so much fun. Make sure you always stretch before any workout. Here's mine before busting out 10 push ups on the beach the other day. Now to the good stuff! I always mix a little bit of this and add that, with whatever ingredients I have in the pantry and fridge. I've tried to provide measurements for the brownie I just posted on Instagram. Apologies if it doesn't come out 100% but do what I do and try and work out the consistency and if it's too watery or thick add more or less liquid. I pretty much experiment in my kitchen and if you don't have almond meal, you can blitz oats or use wholemeal flour. I really do hope you enjoy this "Macadamia Blueberry Brownies" creation of mine. Let me know how you go and tag any pictures on social media under #DaniandCo. Method: Preheat oven to 180C degrees - 356F. Line a tin with baking paper, spray with nonstick spray. Microwave coconut oil and pour over choc chips or cacao until all melted. Add blueberries. Add the Greek yogurt, stir in the vanilla, salt, baking soda, crushed macadamia nuts and coconut sugar. Blend almonds until they resemble almond meal. You will need 3/4 cup or add more if the mixture is too wet. Mix and combine into greased proof tin and bake approx. 30 minutes or until cooked. Do the skewer test and ensure you don't over cook it. Guey chewy is a great consistency. I love it! 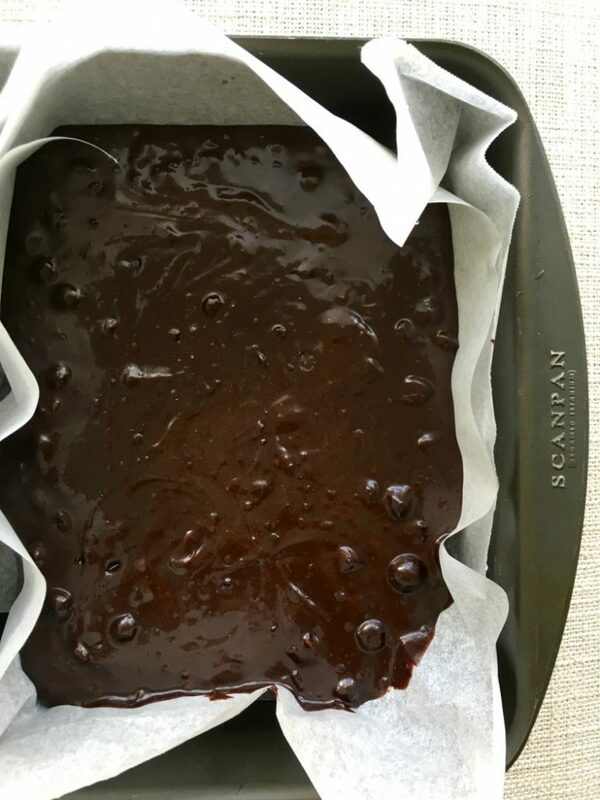 NB: if you don't have a baking flat tin, do what I did and lay the baking paper within a large baking tin and fold up the sides and create your own brownie mould! That's it! Allow this brownie to cool down and either eat on its own or place icing on top or filling in the middle. 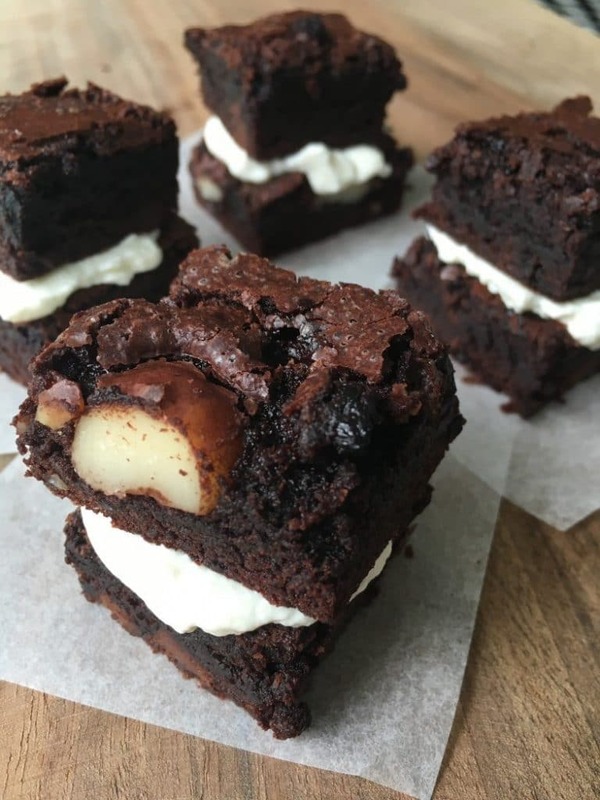 We love cutting little squares and making mini brownie sandwiches. Also if you are nut free, simply omit the macadamia's or if you love nuts use other varieties and experiment. Happy Easter to your family from mine! Don't over indulge in too much chocolate! I know it's hard....I've been there so I need to train my brain to stop after the 10th mini chocolate egg! Check out our day to day behind the scenes on Snapchat. I'm going back to bed. "Easter is the only time of year, you put all your eggs in one basket." What have you got planned this long weekend? We have friends visiting from Melbourne, so we will do the traditional tourist thing and of course hit the theme parks again!